How Do I Become a Working Actor? Becoming an actor involves talent – but hard work, persistence, and industry knowledge are what moves talent into the spotlight. Although the road to being a professional actor can be long, if you have a positive attitude towards learning as much as possible, meeting new people, and loving what you do, the journey itself will often be filled with joyful moments and triumphs. Actors and actresses work at expanding their skills, whether they are still waiting for their breakout role or have won multiple awards. One of the challenges (and benefits) of being an actor is that there is always something new to learn or improve upon. 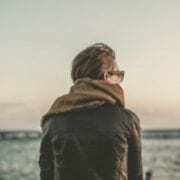 Whether you try your hand at improvisational acting, take voice lessons, or give a new type of theater a shot, just about anything you learn will come in handy at some point in your career. Taking summer acting courses, attending acting camps and auditioning are all learning experiences that also give you the opportunity to network with others in the industry. Acting is a tough road to try to go alone. Making connections with other actors, mentors, agents, and teachers increases your knowledge of the industry, betters your craft, and boosts your chances of being put in touch with a high-quality agent or casting call. Just about everyone in the acting industry has worked hard to get where they are and has wisdom and experience to share. Actors and actresses face rejection, no matter where they are in their career. 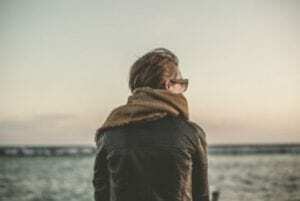 Whether an agent says “no” to representing you or you’re turned down for a part, perseverance provides an actor with the will to move on and try again. The best way to become an actor is to keep acting, perfect your craft, and avoid becoming discouraged. Good actors treat each professional experience as a learning opportunity, knowing that their love for acting does not hinge on getting one particular role or landing a specific agent, but knowing that the next opportunity for success deserves their best shot. For more tips and insights on becoming an actor, check out this article! https://cgtv.la/wp-content/uploads/2017/01/cgtv-1.jpg 362 540 R'Mante https://cgtv.la/wp-content/uploads/2018/10/CGTV-Logo-300x106.png R'Mante2017-01-23 18:53:482017-04-21 15:54:38How Do I Become a Working Actor? 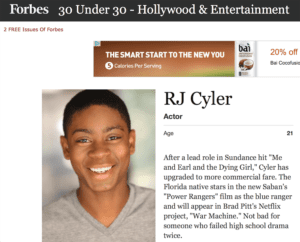 RJ Cyler, Forbes Magazine 30 under 30 list! We are coming to many major US cities and International Cities across the globe in 2017. if we are not coming to yours, you may want to consider traveling to a city nearby. We will post which cities on our blog as they are announced. Our grads are on Fire, check out RJ Cyler the newest winner of the Forbes, 30 under 30 distinction. Other winners of this illustrious awards are people like Mark Zuckerberg, so RJ is in great company. We found, trained and put RJ in front of all of our hollywood agents, managers and connections. That training and those contacts got him exactly where he is today. He is now a critically acclaimed actor for his role in Me, Earl & The Dying Girl and is starring in the summer blockbuster Power Rangers 2017 as Blue Power Ranger. In addition, Brad Pitt picked him up for War Machines, a Netflix Original. If you think you have what it takes and you are serious about getting your chance to shine in front of exactly the right people, we are interested in you auditioning for one of our celebrity judges. From the ages of 5-25, Hollywood is waiting for you. All looks, all ethnicities, all body types, we are looking for every type. We love kids and more importantly, we love making kid’s dreams come true. 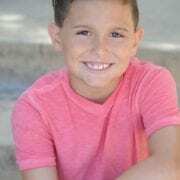 Adrian R’Mante, aka Esteban of The Suite Life of Zack and Cody is not only the owner of CGTV, he is the hands on acting coach, film scene director and mentor to each and every participant that comes through CGTV. While he has a celebrity staff that have almost entirely come from Disney Shows, he makes sure each student gets his personal time as well. 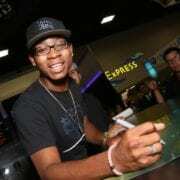 RJ Cyler dreamed a big dream and is now living that same dream. https://cgtv.la/wp-content/uploads/2017/01/MV5BMjAzNTI1MDQxMF5BMl5BanBnXkFtZTgwNTQyNDE1OTE@._V1_.jpg 528 800 R'Mante https://cgtv.la/wp-content/uploads/2018/10/CGTV-Logo-300x106.png R'Mante2017-01-16 17:25:522017-04-21 15:57:37RJ Cyler, Forbes Magazine 30 under 30 list! CGTV Grad Proves Persistence Pays! CGTV could brag for days and days about the successes our students have seen in TV and FILM because of the CGTV program. Instead, we urge you to review the success stories that we have created from grads and parents alike. Listen to what one mom has to say below. We had been hearing about CGTV from an acquaintance for years. Julian has been asking us to get him involved in acting since he was just five years old. We did not act on it right away, we assumed it was a passing phase and waited for him to move on to his next idea. But, he didn’t stop bugging me. He was very persistent and continually asking me to please look into it. I decided to sign up to receive emails. My husband and I finally made the decision that we would help Julian pursue his dream. The next day, CGTV sent out an email stating they were auditioning in LA. We took this as a sign, and we signed him up. I didn’t think he was nervous at all, but I was! He was very excited but I had no idea how to prepare him so we did not prepare at all. We told him to do his best and hope for the best, but expect the worst. The last thing we wanted was for our son to get his hopes up only to be crushed by a Disney Star. We decided that if this was what Julian truly wanted to do, that we would figure out a way to help him succeed. We later found out that Julian was very nervous and that he had prepared on his own, practicing every chance he got. When we arrived at the CGTV audition, Julian was very nervous when he saw that he would be auditioning for Hutch Dana, the Disney Star from Zeke & Luther. Julian did great under pressure and told me that he felt good about his audition no matter how it went. I tried to stay positive for my son, but also tried to prepare him for the potential of not being selected. Waiting was hard and definitely stressful. Hutch thought Julian had real star potential and we got that callback. We were so excited for Julian, we were astonished as parents and made a decision that we would invest in our son. We have taught our children to follow their dreams and supporting them was never in question. More importantly, Julian made a commitment to attend the program, do his best and really put his heart into it. He was super grateful that we were willing to support him. My favorite part of the program was watching Julian grow. Every day, he changed, in a good way. He was hungry for the notes given at the end of each scene and fought hard to improve every second, minute and hour of the day. While Julian had been on stage for years as a dancer, this LIVE show at the ACME theater was new for him. We wondered if the Hollywood Agents and Managers in the audience would see what Hutch saw in our Julian. We desperately tried to prepare ourselves and Julian for if they did not. Did we get a callback? We got 4 callbacks the first time we did the All-Star Weekend and another 4 callbacks the second time we went back to CGTV. 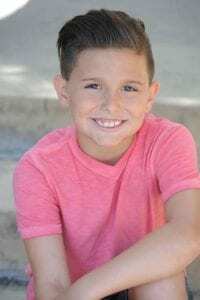 Eight callbacks from agents and producers that would have never given us the time of day without the association to Adrian R’Mante and CGTV. I was totally unprepared and blown away by the interest in my son. Adrian and his cast of actor trainers helped Julian so much. So many doors have opened for him and he has learned so much. Truly, this is the fast track to Hollywood success, IF your child has a natural talent. This program truly lived up to everything we expected and more! Adrian truly is there for you…and I don’t know how he does it!!! The experience is completely priceless. Julian’s life would not have been the same without his CGTV experience. https://cgtv.la/wp-content/uploads/2017/01/image1-2.jpg 720 479 R'Mante https://cgtv.la/wp-content/uploads/2018/10/CGTV-Logo-300x106.png R'Mante2017-01-04 09:00:412017-02-05 23:51:49CGTV Grad Proves Persistence Pays!